Spring training is happening in Florida and Arizona and as baseball players shake the rust of the off-season from themselves, so do fantasy baseball players. Fantasy drafts — be it snake or auction — will be happening soon (hopefully yours didn’t already occur!) and as such, some level of preparation would be expected. Believe it or not, there is more to fantasy baseball than mere spreadsheets, and I say that knowing full well it could cost me my job here! The truth is perception, hype, momentum or whatever you’d like to call it can play a huge factor in determining where or for how much any given player goes for. One way of getting a firmer grip on the fantasy baseball community’s collective value on a player is to conduct a mock draft. There is no shortage of mock draft platforms around, but for the purposes of exposure to a great crowd, I’ll be overlooking the ESPN, Yahoo! and CBS mock draft capabilities. Instead we’ll be looking at some premium (read: paid membership required) websites, specifically Mock Draft Central, Couch Managers and RT Sports. And just to get in front of this, no, this isn’t a sponsored post, I promise! 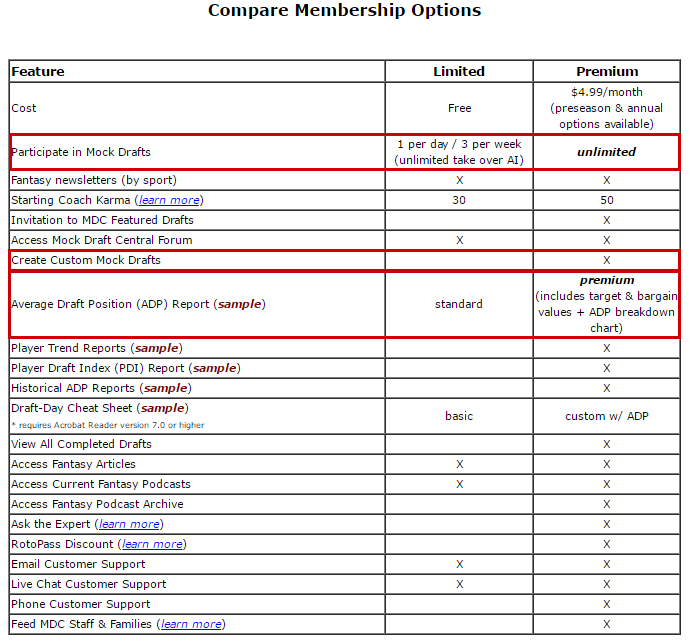 Now with any of these three websites you don’t need a paid membership to join a draft, but you may need one to create a custom draft. If nothing else, MDC has an incredible pre-purchase walk-through and example of options. For example, if one opts to go for the annual package, you’re given just about any level of access that a commissioner would have in a real draft. That is to say moving picks, editing or fixing picks, etc. A full breakdown of the differences are listed in this helpful chart from MDC, though it should be noted the highlighted areas were my doing. Note: Click to embiggen any picture in this piece. 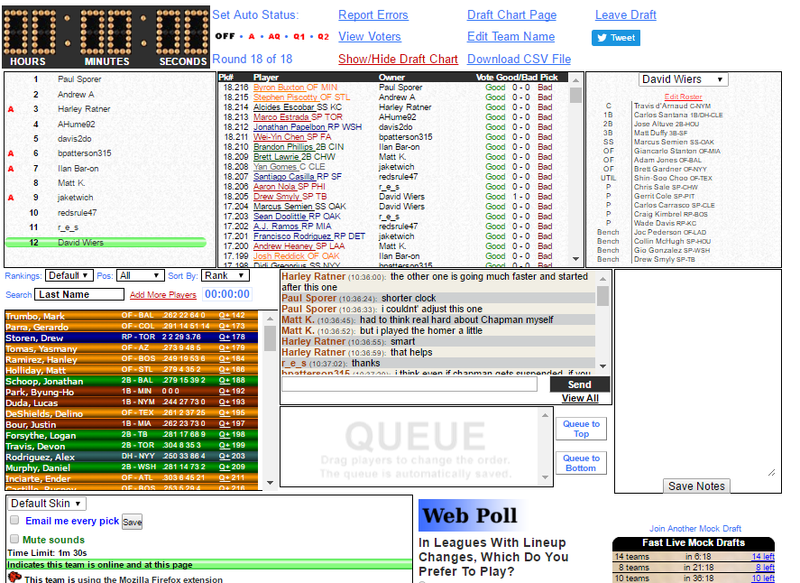 The ability to join unlimited mock drafts is great, however one per day (for a maximum of three in a week) seems like more than enough, even for the most addicted fantasy baseball player around. MDC’s “Coach Karma” is basically a way of the site protecting their users from one another. For example if you join a mock draft, but fail to show up, leaving the other mock drafters to wait while your slot gets auto picked, you’ll lose Karma. Similarly, rudeness and other poor behavior can lower your Karma as more and more users report you. There is a threshold of low Karma that if reached, will not allow you to participate in a mock draft. So basically, just follow Wheaton’s Law and you won’t have to worry about your Coach Karma. I really like the user interface at MDC, something that can’t be overstated enough as it’s intuitive and straightforward. Mock Draft Central’s ADP is currently limited to the top-255 picks, though that number can float depending on the recent qualifying mocks. My enthusiasm for the MDC user interface doesn’t carry over to CM here. Couch Managers, despite also color coordinating things similarly to MDC, just doesn’t have the same level of eye candy. The notes section is helpful when typing on the fly, but for me, I have my spreadsheets open during the draft and can make notes or highlight things there. One thing I really enjoyed was the Good Pick/Bad Pick voting system on CM. Unfortunately during the draft you can’t see who voted for which pick, however after the draft is wrapped up there is a section to see the full break down with Good Pick votes on the left and Bad Pick votes in the right column. The ADP is limited to the top 265 picks at CM, similar to MDC where deep leagues or 14-teamers could be left out in the cold a bit. For example, the picture above shows three Good Picks casted on the Marcus Stroman pick at 7.76 pick. Given I picked nits with the draft lobby from Couch Managers, I’ll do the same thing to RT Sports. I’d say that RT is even more boring and less visually appealing as it’s all white board with no color coded positions. The drafting itself is nice and safe in that you have to click the blue “+” sign either in your player queue or from the primary board, then click the blue draft button. Think of the “+” sign as a way to take a closer look at a player before immediately drafting them, and RT even calls the preview window. Unfortunately, along with their minimal design, RealTime Fantasy Sports also limits you to the standard 5×5 categories with no customization. That said, one of my favorite features RT Sports offers is probably the post-draft analysis. I drafted (first overall, of course) against a slate of bots and somehow didn’t manage to project to win the hitting categories, though the system loves my pitching staff. There is a FAQ section for the numbers their projection system spits out, and I encourage you to check it out. 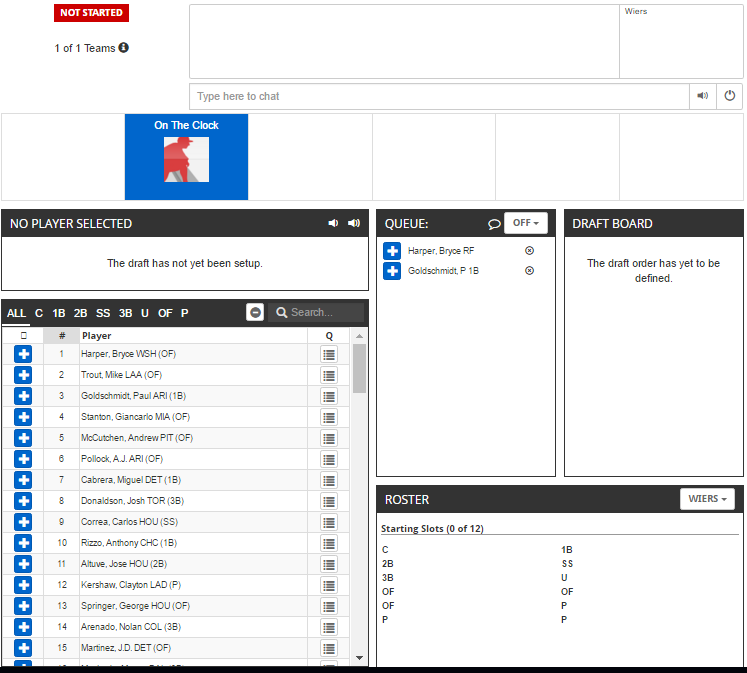 I’ll leave the selling points of RT Sports to those lovely folks, but know that you can create mock drafts with a free, basic account, albeit only standard 5×5 format. For custom league settings, you will be required to upgrade. Really the biggest drawback to RT is probably their top-300 ADP is shown in PDF form, a sub-optimal viewing format if you’re attempting to export and compare ADP’s across different websites. It should be clear there are more mock draft platforms out there — many more — but I only felt comfortable discussing the ones I use semi-regularly to frequently. If I had to pick one, I like RT Sports the most, even accounting for their lack of customization. 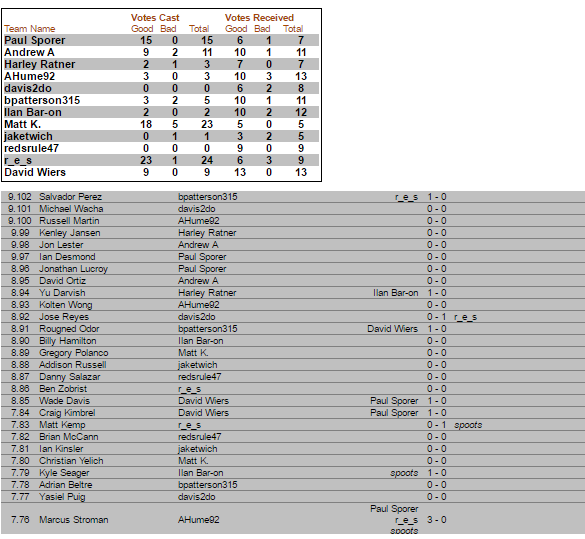 Second place would be Couch Managers, with Mock Draft Central coming in with the bronze placing. Now, who’s up for a mock draft? Listen, I am not — even for a minute — saying that I possess even a modicum of business acumen. In fact, I think it would be safe to say that pretty much everything I know about business comes from 30 Rock’s Jack Donaghy. I do not possess an MBA, and I have a fairly weak handshake. With that all said, the announced partnership between MLB and Match.com could make a lot of sense. However, this does not negate the fact that it all seems very silly. *–yes, there are also photos involved, but that is included in nearly all dating services. Services like Match and OKCupid also leverage common interests, no doubt, but they are not as instantaneous. Match is now looking to tap into that instant-match process by using baseball fandom as a variable. Using the new “Singles” (can you hear my eye rolls through the Internet?) platform, fans can combine their Match.com profiles with their team allegiances. People can search Match for others who have also designated a favorite MLB team, and, 29 team-specific portals will also be available for people to match themselves with others who also root for the same team. I really want to know which MLB team was the holdout. With over a quarter of Match members identifying as baseball fans, now’s the time to make a connection with another single fan online. Connecting over a shared passion like America’s favorite pastime is the best way to break the ice, so visit www.match.com/mlb to start your search today! In the interest of fairness, I haven’t dated in a while. And based on what I hear from single friends, it can indeed be rough out there. But predicating a relationship based on the fact that two people like the same baseball team seems shaky at best. Plus (and I hate writing this as much as you hat reading it), sports are different. There are varying degrees of fandom, to put it lightly. A guy can check a box because he likes going to a game every now and then, where a woman who watches every game and can recite the rosters of every historic team might check that same box. There’s no sliding scale here, it’s a binary response. This can happen with other subjects as well, certainly, but there are no Match.com portals for fans of Hemingway or the movie Top Gun. Match and MLB are trying to pair people together with the help of one variable that can fluctuate immensely. It probably isn’t a recipe for disaster, but it most likely isn’t one for success either. Who knows? Maybe this will lead to some deep and meaningful relationships. Who am I to tell people how they should look for love? But on the surface, the whole situation seems pretty phony. I mostly am worried about St. Louis fans living in Chicago and vice versa. I don’t see a whole lot of room for romance there, but it might give @BestFansStLouis some good fodder. Patrick: Player movement in itself doesn’t seem like a big deal – it happens in every sport, and it gives fans a metasport to talk about during the offseason. But that’s another point, and one of the reasons I have a hard time getting into, say, soccer, let alone the tourney-based sports: is there even an offseason? Sure, seasons are techinically arbitrary endpoints, but having a standings page that automatically resets gives fans a chance to reset expectations, but also gives new fans a convenient entry point. Do esports have such a thing, or do we all have to just jump into it in media res? David: This about the perfect time to pick an esport, actually. The Dota 2 Star Ladder Series is just now starting the playoffs, League of Legends North America, European and Korean Spring Split is yet to begin or is only one week in and in CS:GO, a number of leagues and tournaments are set to kick off in the coming weeks. Given the number of titles that have reached or attempting to reach esports status, there really isn’t an offseason if you wanted to follow every single one. Even if you just picked LoL, Dota, or CS:GO (again, arguably the three biggest esports titles) then following all three would still leave you very little time to do watch any other esport or any traditional sport. For me, my level of dedication is pretty split between soccer, baseball and select esports titles. One thing esports does have going for it is near constant action. As you mentioned earlier from your time in Korea, they had (and now have multiple) channels dedicated to esports. Where I have to wake up early to watch Tottenham play, I can probably tune into Twitch/Azubu/MLB/etc. at anytime and get some solid esports viewing in. In that regard, a lack of a formal, unified season (for titles other than the mostly rigid LoL schedule) is great. P: Near-constant action is great, but I really feel like there’s something to be said for an offseason, especially after the culmination of a single championship. With different games and different tournaments competing for attention, especially with wildly different gameplay and viewing experiences, it seems like there’s a real danger of fracturing the market, if it hasn’t been fractured already. Other sports like chess (it’s a sport, damn it) and even football during the USFL era suffer when there’s no one real champion to hold up at the end of the day. Do you think that the future of esports is a general unification, some level of organization above the corporate/tournament level? I envision something where a “season” requires mastery of five or so different games, each requiring different skillsets and thus requiring different skilled team members (almost requiring the specialization of position players) to attain the best overall record. Is this possible? Or will the unique reality of shifting games and cultures prevent anything that codified from ever taking place? D: I worry about oversaturation and players being exhausted and overstretched, absolutely. I think we saw that this year in CS:GO. There were times where domestic league games were played at a level I think most would call subpar, possibly because both teams just finished traveling to Europe. As for different cups, leagues, and tournament organizations, I have mixed feelings. On the one hand, I love Dota 2’s main event, The International, which has broken the prize pool records for an esports tournament I think three years running. On the other hand, teams focus almost entirely on qualifying and seeding for that one tournament, with not much else top level competition happening throughout the year. It’s a topic that clearly cuts both ways, and while both LoL and Dota 2 crown World Champions, as does StarCraft II, CS:GO doesn’t. I’d like to see a World Champion of Counter-Strike like back in the days of WCG, but even then the WCG winner had to contend with the summer and winter CPL winters. Personally, I’m all for the leagues uniting to offer a world series of CS:GO, but due to sponsorship needs and contracts, I don’t know if we’ll see that for awhile, at least until the developer steps in. And my concerns aren’t just about gameplay quality either, but content delivery. With MLG being sold to Activision Blizzard recently and ESL purchasing ESEA late last year, and now the SSL being live casted only on Dingit I’m concerned about esports fans consumption, and no, not just the stereotypical Mountain Dew and Doritos. Twitch.tv is the undisputed king of streaming platforms, but it’s gotten to the point where the numerous flaws in Twitch are being recognized and then quickly forgotten, almost as if esports fan don’t want to give MLG TV, YouTube, or any other competitor a real chance. That said, some Twitch competitors such as Dingit is pretty awful, as is Azubu and Afreeca, but I’ve personally had the exact same problems on Twitch as I have with MLG. Heck, if more people used YouTube to live-stream, I think that could be the best among them given the Google backing it has. I guess my dream scenario, at least for CS:GO (as they lack a World Champ) would be for a World Series-type event, probably in the form of the top eight teams in terms of tournament and league placings (not fan vote) meet in a December showdown to crown a champ. The event could be broadcasted by CS:GO itself (Spectating in-game rather than in-browser) that way no tournament or league could complain about ad revenue, viewership, sponsors and subscriptions…basically, like almost all things, esports is about the bottom line. P: So the question that will have to be asked over and over: are esports a sport? What makes a sport a sport? D: I can’t get there and call it a sport. It can be physically demanding, mentally exhausting and injuries (RSI, carpal tunnel etc.) but I still can’t call it a sport,. To me, and I could be way off base here as I equate professional sports with pro-gamers, a professional athlete has some sort of natural athletic gift. It could be throwing a fastball, running a route, kicking a ball, whatever, but some physical aspect shines through. While there is aiming, reflexes hand-eye coordination and the other physical things a part of esports to be sure, it is not on the same plane as soccer, baseball or even golf. P: I’m finding that in my old age, I’m growing increasingly indifferent to the physical aspect of all sports. As a participant, sure, physical exertion and execution if a major part of playing a sport; as an observer, staring at the action on a television screen, the images are already devoid of physicality. Whether those images represent actual people sweating, or are representations of people sweating controlled by people in office chairs with gamepads, has no real effect on my experience. Execution is great and all, but I don’t watch basketball for the free throws or football for the extra points. It’s the strategy, either on the larger scale or the split-second reactionary one, that makes sports interesting to me, and that translates perfectly to esports, or chess, or even an episode of Jeopardy!. At some point, maybe it’s no longer sports, but I don’t know where that line is and I can’t really make myself care. Let’s take a hypothetical situation where two people are playing RBI Baseball against each other on Twitch. How is that different, to a viewer, from a recording of a high school baseball game? D: It probably goes back to reaction times and then level of play. An 16-year-old center fielder might take a bad route or a hitter could be late to a fastball. Sure, those types of issues or errors can be coded into a game as well, but that difference — at least to me — is very huge. As for the level of play, I wouldn’t want to watch low level baseball just like I wouldn’t want to watch low level esports. Watching a Bronze StarCraft II player or Silver CS:GO player is similar to coach-pitch baseball and softball. It’s the same game as the pros are playing, but the difference in skill is the impressive part. Maybe that’s one of the things still holding eports back: an inability to convert the level of difficulty to the general public. When someone gets a pentakill in LoL or Dota 2 or a clutch ace in CS:GO, it’s usually an extremely rare and difficult feat to accomplish. Without a basis of comparison, the average non-esports enthusiast might interpret nothing but a bunch of characters, colors and effects on the screen. Just about everyone can recognize the brilliance of a walk-off home run versus very few people recognizing the brilliance and game sense in a 1v5 clutch situation. P: That’s true. But from the perspective of the person watching on the couch, what’s the difference between watching athletes on a television screen and watching digital representations of athletes on a television screen? What makes one sports and the other not quite sports? D: As far as spectating goes, it’s an increasingly small difference, but I’d wager the difference is the element of, I guess for lack of a better word, risk. Reaction times are critical in both sports and esports, but when I’m playing MLB 2K16, the fastball aren’t actually humming by me, etc. Not to understate the injuries in esports, but the risk and danger to the players is very different. I highly doubt anyone watches baseball for the beanings or football for the helmet-to-helmet hits, but with physical stakes considerably higher on the field than on the screen, I suppose that would be the difference to the viewer. P: Is the physical risk to the athlete actually exciting to you? I honestly never even consider it. D: I don’t think “exciting” is the word, but it’s certainly something I’m aware of. Here’s a video of me facing 50 mph and 70 mph in the batting cage. The highway speed pitches aren’t even close to a major league fastball and I was flailing helplessly. Of course, batting cages aren’t consistent, no seams, etc., but really, I was never going to stand a chance against 70 mph. On the other hand, I’ve played against top tier talent in CS (Hell, Stuard Holden, former Bolton Wanderer and USMNT player and his team steamrolled my team and me several times) back in the 1.5 and 1.6 days, and while we didn’t fare well, my team and I certainly did better against them than I would against an MLB pitcher. Sure, this is just one example and perhaps time has colored my memory a rosy tint — I wish I still had the demos, sadly that computer is long gone — but even semi-pro CS teams can take a map off of pro teams. I can’t see an Indy ball team winning a game against an MLB squad. To come back to your question, I’m more impressed with the physical ability of pro athletes than I am of the reaction time/aim of esports. The risk involved is secondary, maybe tertiary to what I’m watching, but it is a factor for me. If tension equals compelling story lines (and reality TV would make it seem so), then the physical stakes of sports is much higher than esports, and thus I’m more impressed with sports over esports, and I’m a massive esports fan. I mean, I’m watching DreamHack Leipzig (SCII and CS:GO) as I’m writing this! P: College baseball teams win occasionally against major league teams! That’s one of the great things about baseball, I think. Okay, so let’s move on. We’ve talked about how difficult it is to become a sport, all the logistics that go into creating the sport itself and what can make people a fan of it. People quote the viewership and the dollars that go into the industry, and these are all very important things. But esports have a strange cousin that receives next to no money or attention, except for a couple charities a year. The scene is also nearly completely opposite: individual-focused rather than team, supportive, almost non-competitive. While tournaments take place in giant arenas, speed running takes place in people’s homes, or at most in hotel banquet rooms. And yet the product, the actual gaming, is at least to me as compelling, if not more, to the head-to-head gaming scene. Is speed running a sport, in your mind, and what makes it fall into such a different realm than the DOTA/LoL sphere? D: I don’t think speed running is an esport. I adore guys like siglemic et al who do the N64 speed runs of Super Mario 64, but I can’t get there as an esport. The level of competition is certainly there, yet so many speed runs depend on glitches, bugs, etc. that would never fly in a league or organized format. For example, Halo 2 speed running is actually done an older patch of the game, because Bungie opted to remove the sword flying/rocket canceling exploit. It’s a high level of competition, but I can’t get there as an esport. I’m torn now. I don’t see speed running as an esport right now, but I reserve the right to change my answer. If that’s flip flopping, well, so be it. P: I just find it compelling as a viewing experience. GDQ just wrapped up their winter charity marathon, and while I missed most of it, there’s just so much spectacle: two players playing Super Metroid on a single controller, a guy getting all the way to Tyson on Punch-Out! while wearing a blindfold, listening to audio cues and timing dodges. It’s really fun to watch, and it’s fun to watch in exactly the way that sports are to a lot of people: seeing the same games played by average people, done to an incredible degree. There’s just so much joy to the experience, a level of sportsmanship and collective pleasure in Beating a Thing, that you don’t see in directly competitive sports that often. It’s Bautista’s bat flip without a pitcher to embarrass. It’s great. What do you see as the immediate future of the sport? What does it need to do to gain popularity/acceptance with the potential fan? D: I’m going to sound like a candidate running for office here, but I have a three point plan on how I think it will happen. We’ll soon find out, given the first, big step, is already all but wrapped up. The Turner Esports League will hopefully bring a boon to CS:GO, and thus esports as a whole. It’s set to kick off this summer and I’m optimistic it will catch enough positive attention to really gain traction in the general population. I’m taking for both teams and organizations as well as players. It’s a mix of maturity, penalties, restrictions and binding contracts is something desperately needed. Teams drop rosters, churn or cut players, while different players quit on their teams, leave games while a match is live, etc. I know some organizations do have legal contracts, but other orgs appear shady at best. Already various esports related companies sponsor teams. For example. Intel, Hyper X, Razor, Nvidia and many others are involved, but few non-esports related sponsors are involved. There is Samsung, Korea Telecom, CJ Group, but most are in South Korea. I remember Stride Gum had a personal sponsorship with Tyler “Nony” Wasieleski, but those types of deals are far too infrequent. I like to imagine a day where it’s like soccer, with various airline companies or banks sponsoring teams. P: So this is how the sport will become successful as a business model. But how will it become loved? How will it reach out to people who hate millenials or think blood is a necessary part of entertainment? How will it win my heart, Wiers? D: I’d argue that it is already loved, haha, but I get your larger point. The on-screen action is still the primary form of entertainment, but to circle back to an earlier point, the interviews, ceremonies, celebrations, basically the *style* in which the esport is played will help capture people’s hearts rather than just their fleeting attention. Without sounding too much like Office Space, it’s about the flair and the drama. I’m generalizing here, but for me, a compelling story in esports is infinitely more interesting than in the traditional sporting world. I didn’t particularly care when Jon Lester pitched against the Red Sox as an Oakland A, but please believe I was glued to my screen when Spencer “Hiko” Martin played his first match for Team Liquid against Cloud9 after he left C9. Esports drama is basically a reality TV show for me: it’s a never ending source of entertainment, though still secondary to the in-game action. I could be off here, but given how much esports figures interact with the general public (meaning, via Twitter, vlogs, blogs, etc.) versus traditional athletes, the big difference seems to be just how unfiltered the esports competitors are. There is no HR department to screen bad tweets, and few repercussions for them in the first place. I wouldn’t call the esports world transparent in the least bit, but definitely unfiltered. Some esports figures, not just the competitors, but commentators, writers and hosts as well, often jump in with the banter. Sometimes it feels like they’re just baiting the fans to post reactions on Reddit or Twitter, but the interaction, at least to me specifically, is at least refreshing. Imagine David Price jumping into a random thread on r/baseball. Now shrink that down about 1000 times and you’ll have a close comparison to when an esports figure pops up in a thread on r/dota2 or r/globaloffensive and the like. I feel like fans of anything desire interaction with the stars in their respective fields. The level of interaction in the esports realm far outpaces — for better or worse — that of traditional sports. Get people to pay attention to your esport for a game, have a sharp interview, be personable on social media and bam, you have a likeable (and marketable) esports figure. That’s how people will get drawn in. P: I hope so. It’s interesting to watch any sport in its relative infancy, creating the foundations for its own future heritage. I’m not sure that this iteration of esports is for me, or even meant to be for me; I prefer a more methodical, chess-match style of battle, one where the audience can scheme along with the participants. I guess what I prefer is actual chess, which is just never going to happen. Or a blend of poker and esport in which two players sit across a table and play Twilight Struggle with their cards exposed to the camera. D: Instead of Chess or esports, what about streaming a game of Risk or Settlers on Twitch? I think I would watch a streamed Euchre tournament, but that could be my inner Michigander coming out. As far as watching esports grow from a nerd niche to a wider audience (and hopefully mainstream in the coming years), it is amazing to view the progression. Will I one day say I watched Olof “Olofmeister” Kajbjer in a similar way I’ll talk about Mike Trout? Maybe, maybe not, but we’re certainly closer to that happening than we were even two years ago. And that’s enough progress for me. P: Me, too. Thanks for answering all these questions, David. It was fun. D: Thank you, Patrick! Hopefully my rambling words (that may have flirted with a rant from time to time) can help bring a wider audience to the outstanding realm of esports. Also, I’m not sure exactly where this would fit, but this link (posted today) has some awesome charts/graphics on the rising money in the esports industry, with a projection for it to reach over $1 billion in 2019.